Adventures In Storytime (and Beyond): Monkey Business! I've been doing a "Jungle" theme on the Storytime Bus this week, and one of the books I've really enjoyed using is Mac Barnett's Count The Monkeys, so I decided to build my regular Friday storytime around it, with a "Monkey" theme, especially since most of the kids seem to know and really enjoy doing the "Five Little Monkeys" rhymes. Five little monkeys, jumping in bed. One fell off and bumped his (her) head. "No more monkeys jumping in bed!" We talked a bit about why you shouldn't jump on the bed, and then sang our story song to help us get settled for our first book. 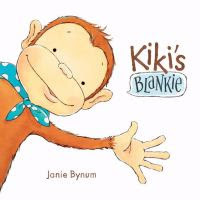 Kiki's Blankie by Janie Bynum is a cute story about a little monkey who is very attached to her blankie, which most kids can relate to because they remember having a blankie or stuffed animal they were attached to (or still are). Kiki takes her blankie everywhere, and uses it as a napkin, a bandana, a superhero cape, and more. But then one day the wind blows it away, and she must rescue it from a scary crocodile! Will she ever get it back? Since Kiki had to climb the coconut tree to rescue her blankie, I decided to transition into singing a song about a monkey climbing a coconut tree. Itsy, bitsy monkey climbed up the coconut tree. Down came a coconut and bopped her on the knee. And the itsy, bitsy monkey climbed up the tree again! 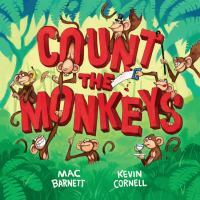 Next we read the book that was the inspiration for today's theme, Count The Monkeys by Mac Barnett and Kevin Cornell. This book is so much fun to do in storytime! It has everything: animals, counting, unexpected twists, silliness, and a surprise ending. We start out to count the monkeys, only to find a king cobra has chased them all away. Luckily, two mongooses (or is it mongeese??) chase him off. But then three crocodiles show up! It's one thing after another, and we fear we are never going to see those monkeys! The story prompts a lot of interaction with the audience; it reminds me a lot of Tap The Magic Tree, only sillier and with counting! Since we had crocodiles in both of our stories, it only made sense to do a rhyme with monkeys and a crocodile (this one is more often said as an alligator, but I use either alligator or crocodile, depending on what goes best with our stories). And SNAPS! that monkey right out of that tree! Just Mr. Crocodile as happy as can be! For our last story I read one I've used before in a "Shark Week" storytime, The Monkey Goes Bananas by C. P. Bloom and Peter Raymundo. 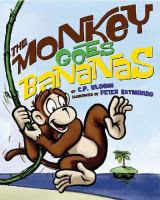 This book tells the story of a monkey stuck on one island, who spies a banana tree on another island. Sadly, the waters in between are patrolled by a fierce shark. Will he ever get the delicious bunch of bananas? This story is simply told with only one or two words on each spread, relying on the narrator's expression and the illustrations to tell the tale of the best laid plans going awry, and narrow escapes. In the end, the audience will be surprised by who ends up with the banana. I had thought about doing the "Go Bananas" chant before we closed, but the group was already getting a bit wound up, so I decided against it, and just went ahead and concluded with our closing song and stickers. This week I had extra special scratch-'n-sniff stickers! And no, they did not smell like monkeys, but like bananas, and the kids were very amazed. While they were not the perfect little angels that they were last time (which I expected), they were still pretty good, especially considering most of them have only just turned 3, only their second storytime with me, and it was a larger group today (16 compared to 12 last time). There was some wiggling, talking, and getting up, but overall I still think they were very engaged most of the time. They seemed to like all of the books and songs/rhymes we did, and since most (if not all) knew both "Five Little Monkeys" rhymes, I had excellent participation, both with saying the words and doing the motions. They laughed at Kiki's falling asleep on top of the washer and dryer while waiting for her blankie to get dry, loved the silliness and the inter-activeness of Count The Monkeys, and the drama of The Monkey Goes Bananas. They LOVED telling me they saw the monkeys in the end-papers of Count The Monkeys, after we had given up on ever seeing them. I got quite a few hugs at the end, and one boy in particular said he had to give me a BIG hug. This is my third school year coming to this classroom (where I got my start doing storytime), and they always remind me of how much I love my job! Very fun ideas!!! I am doing a Monkey Business theme in June for toddlers and preschoolers and these ideas are definitely going to be used.! I am at https://misscathiesstorytime.blogspot.com/ if you ever want to exchange ideas! Just started this adventure....super fun! "Count the Monkeys" is one of my all-time favorite storytime books because it is so fun and interactive. I highly recommend it!